Lia winning Best Veteran in Specialty at 13 years. Lia combines all of the desirable schnauzer attributes; she is feminine and robust at the same time; she has an incredibly sweet temperament , and is affectionate and playful. She has a fabulous harsh coat and seems to walk on air. Lia started her show career when she was 6 months of age, earned her championship from the puppy classes and never looked back. Along the way she earned hundred group placements, an all-breed Best in Show and her Rally Novice title making her a Grand Champion Excellent . 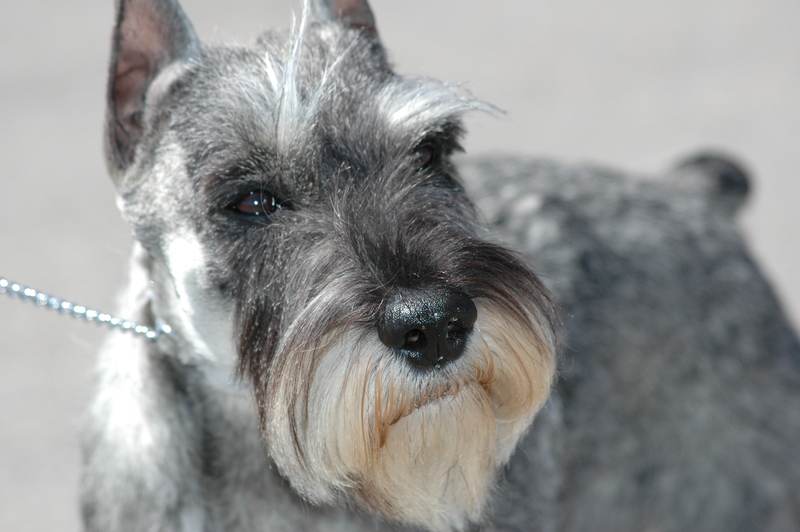 Lia was recognized as the top Schnauzer in Canada in 2006 and 2007 . August 18, 2012 Lia earns the title of Rally Novice ! Lia has produced two wonderful litters one in 2009 from AM CH Geistvoll Double Diamond “Dylan” and her daughter Ciara resides with us. And one in 2011 from AMCH Scarlights Seasar ad her daughter came back to give us two wonderful litters.